It’s ironic that, in comparison to one another, the Rocky Mountains aren’t and the Appalachians are. Put more directly, if the only rocks on the Appalachian Trail that hurt your feet were limited to Pennsylvania, then hiking the AT would be a piece of cake. Unfortunately, ugly boot-eating rocks are everywhere throughout the length of the AT. Even if you could run from them, you couldn’t hide. On my recent 160-mile training hike, the southbounders regaled me with stories about under estimating Connecticut while bitching about New York, New Jersey and Maryland rocks, all in the same breath. Don’t even start them on New Hampshire and Maine. Pennsylvania? They described it as “average!” Vermont seemed to be the only exception, but what kind of trade off is mud? Late on day eight, a particularly rocky stretch on the steep down hill from Mary’s Rock (best view of the Shenandoah Valley) was eating my feet for lunch. The trail was seriously rocky and my feet hurt like hell. I still had four miles to go. In the low angle light of the setting sun I glanced at my hiking poles and noticed a string of spider webs streaming from them like Tibetan prayer flags. That would be serendipitous I thought. If my poles only had prayer wheels, I just might make it. That’s when I began thinking about classifying the different kinds of rocks under my feet. Rocks aren’t just rocks. Each has a job and role to play as part of the trail. The more benevolent among them are esthetic. Usually covered in moss or lichens, they hang out like runway models along the sides of the tread. Others tumble down talus fields or become giant boulders that frame the scenery. 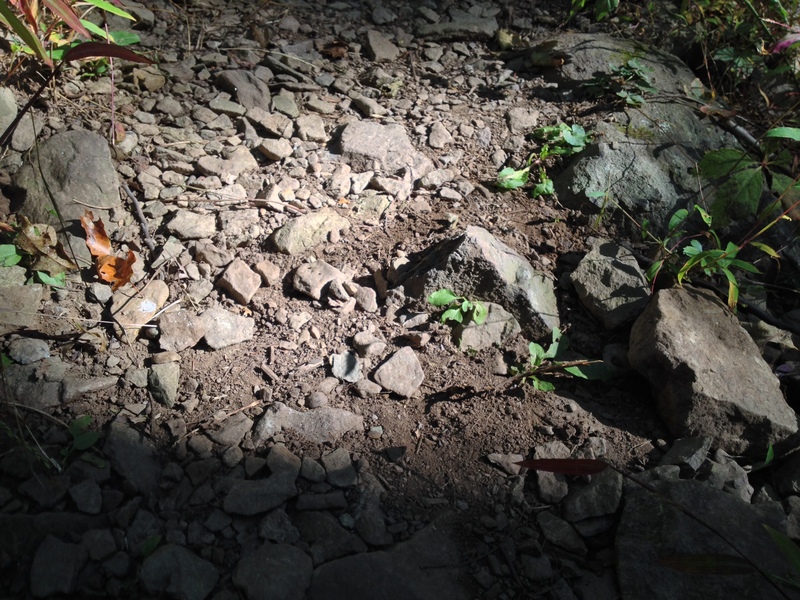 As for the rest of them, well… There are generic Pennsylvania grade rocks. They primarily ensure that the trail surface is as uneven as possible with the idea of slowing down hikers. Think of the as speed bumps. Among the most common are Tennessee Tripping Stones. These are specially planted snaggle tooth rocks notable for their triangular shape resembling miniature Matterhorns. They’re found randomly and with a surprising regularity. When hidden among generic rocks or obscured by leaf litter, it’s easy for them to score stumbles and bruise toes. The trail has teeth. One of the least of my favorites are a certain kind of small loose rocks that cause very nasty falls. When descending down hill, hikers have to put their weight on their lead foot. If you happen to step on a round rock that acts much like a ball bearing, your downhill foot shoots out from under you, and you assume the telemark position in cross country skiing as your trailing knee dives into the trail. Since I love compound German words, I made one up for these kind of rocks – kugellager steinen or ball bearing rocks – seems apropos. Along the way I found a few Shenandoah Stumbling Blocks. This glorious style of coffee can-size stones appears randomly in hopes of hobbling, harassing and slowing. They love to hide in leaf litter. Then there are universal ankle rollers. These you never see, but you know what happens. My least favorite is the Susquehanna Snot Slicker. This type of stone is used almost exclusively for stream crossings. Notable for their teflon-smooth convex surfaces, their dome shaped top ensures that hikers get a minimal grip on them. Very slippery when dry, they’re slipperier than snot when wet. Cross at your own risk. But it doesn’t end there. Terrible talus and pole benders are abundant too. Get movin’ too fast when a pole bender traps your walking sticks, and Leki gets to gift you a new end segment ’cause the old one has just taken a 90 degree turn! There must be more. I heard about crazy capsizers – loose stones that turn over when you step on them, but I didn’t encounter any.